Association of the Choquet-tes of America Inc. The adventure began in 1965 with a parish priest, Elisée Choquet of Varennes. He was dynamic and passionate about genealogy and successfully reunited over 350 descendants of Nicolas Choquet and Anne Jullien. This first reunion, while raising interest among Choquet-te families, also served to celebrate the 300th anniversary of Nicolas Choquette’s arrival in America and inaugurate a monument in honour of the ancestor. Jeanne Choquette of Gatineau, another passionate and dynamic adept of genealogy, inspired by the work of her grand-father, Gaston, and seconded by her father, Jean of Anjou, Quebec, decided to organize a second reunion of the Choquet-Choquette families of America in 2002. Over 700 Choquet-te’s from Quebec, other Canadian Provinces and 22 American states converged in Varennes on August 3rd and 4th, 2002, to fraternize, celebrate, encourage artists bearing our name, and pay tribute to our ancestors by commemorating stories of their family. And let’s not forget the visit to the famous monument erected in honour of our ancestor. The Association was born out of a meeting held in the context of this Reunion on June 1st, 2002. Twenty people attended this special meeting (see photo at the bottom of the page). On June 10, 2002, the Inspector General of Financial Institutions of Quebec sent out the patent letters officially recognizing L'Association des Choquet-te d'Amérique Inc. (the official title is in French). Sub-committees (statutes, rules, recruitment) were also established to see to the 2003 Annual Assembly. The Association is now a member of La Fédération des associations de familles du Québec. Why an Official Family Association? First and foremost, to better position ourselves to respond to our intellectual curiosity from a historical perspective regarding the biographies of our ancestors, but also to extend the family circle and create friendships among our peers. Print, edit, distribute any publication for the ends described above, set up a library of publications dealing with the Choquet-te family history and heritage. It is an official association with proper legal status (non profit organization), a permanent body, with democratic rules, as a board of administration elected by members will manage it. There will be an arm dealing with historical and genealogical research. Another arm will see to the management to guide the decision-making process, to oversee the secretarial role and memberships, to plan and manage revenues and spending, to orchestrate eventual meetings or activities, and so on. There will also be a communication division as any family association officially publishes a liaison bulletin. Get answers (on request) to genealogical and historical questions. 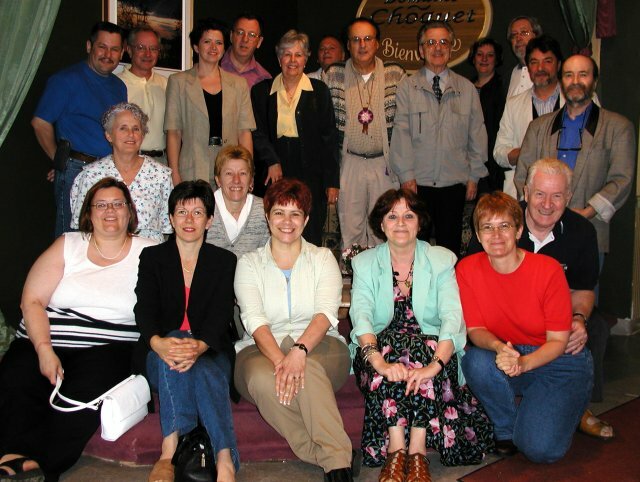 Founding Members of the Association of the Choquet-tes of America Inc., June 1st, 2002, in Varennes.